Digital cameras are wonderful, wonderful things - compared to film cameras, photos cost nothing and are damn near infinite, shots can be arranged and reviewed with ease on the ubiquitous LCD screens, photo storage and organization can be moved from the shoebox to spacious hard drives, and.... well, do we need any more reasons? And yet, there's an element of the experience of film cameras that digital cameras have abandoned: anticipation. The time between the event and seeing the photos of it used to be a magical mix of wondering, waiting, and imagining what the shots will be like, or even of, and how they came out. I may be viewing the past through rose-colored glasses (I did just speak of waiting in a positive light! ), but there was definitely something to it. Something zen, maybe. Hmm. 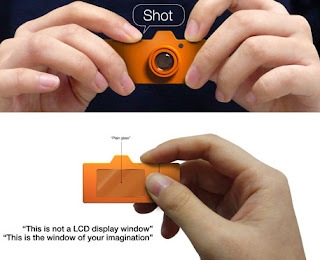 Anyway - designer Sungwoo Park has brought that element back to digital cameras with the EazzzY! concept. It's a digital camera - so you still get the no-cost, infinite photos - but with no LCD screen and only one button, for the shutter. You won't be able to see any photos until after the the fun is long gone. Sure, it's more of a novelty than a primary-use camera - this'll never replace my point-and-shoot Canon - but it may be a good way to remove the obsession from photo-taking ("How does it look? I look horrible, take it again!") and bring back some good, old-fashioned, film-camera-style anticipation.